As I wrote recently when Carbine announced WildStar was transitioning to F2P, the vast majority of game developers are simply kidding themselves in this market if they try to launch a game with a subscription (aka pay-to-play or P2P) or as buy-to-play (B2P). The only MMORPGs that could be launched as B2P are those with deeply established IPs, e.g. Guild Wars or Final Fantasy. That being said, once you’re 3 years into the life of a game, the vast majority of the fans of an IP (whether it’s GW, FF, Star Wars, etc) and/or early MMORPG adopters have already purchased GW2 or made the decision not to try it because of the purchase cost. Part of the value of B2P for the developer is that the purchase price helps to recoup the costs to launch (in this case, many tens of millions $USD), and it provides an ongoing revenue stream. The question about the latter is whether a developer would be better off simply making the game F2P and attracting a broader player base. My belief is that the answer is yes – for a game to sustainably maintain or grow its player base, F2P in this market is a necessity. With the advent of the F2P model, AN can finally attract a much wider pool of potential players. On top of the F2P announcement, AN also announced that HoT will introduce raids. 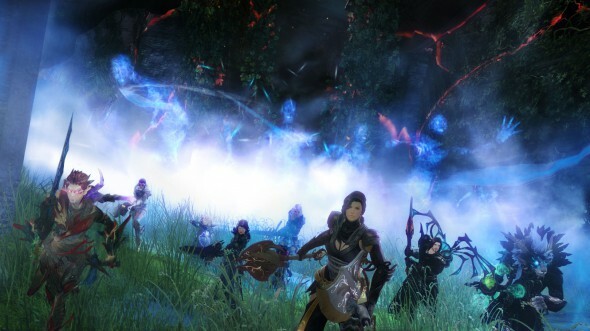 GW2 raids will be 10-person content. For those of you who have nostalgia for the old days of 40-person raids, I believe those days long gone. They simply require way too much work on the part of guilds to sustainably run, and for the developer it’s challenging to devise boss fights and mechanics that work smoothly for raids of such scale. Kudos to AN for thoughtfully solving for the feedback from the community. Sounds good. Although I don’t can’t see how they will make raiding in GW2 as interesting as MMOs with traditional roles. But I’ve been out of the loop for awhile with the game. Prior to GW2’s launch, I was a big proponent of the traditional trinity model going away, because I thought it dumbed down PVE too much. That being said, I think it’s been demonstrated that without the trinity, in GW2 the boss fights become more about a DPS race, and therefore the Berserker meta has been king since the game launched. There isn’t as much value for traditional “support” or healing roles or even meatshields in GW2 as there is in other games, and that’s a shame. I still believe my idea would be the most dynamic and fun experience, but it may never get implemented. ANet also announced that they want to focus on a soft trinity of damage, support and control in these raids. So there you go. Watch wooden potatoes’ video on the raids announcement if you want to see exactly what I’m referring to. I think I disclosed that I had interviewd with BioWare a couple years back. Really enjoyed the interviews with the SWTOR team. I ended up stopping the interview process as I got another offer for a Digital Product Manager job that I still hold today. You should stream on Twitch… although I don’t play WoT, I would still probably watch. I’ve thought quite a bit about streaming again. I find it relaxing to just play games, since I have a pretty intense job during the day and at night I like to be able to log on / off as I feel like it. The most scalable way I can contribute content is via my YouTube narrated videos and written guides here. Some day I may stream again, but I have no plans to soon. Taugrim, does this mean you’re going to come back to GW2 PvP? I’ve been dying for your feelings as I really feel they have developed the systems and that it is currently super compelling. I appreciate what AN has been doing with GW2, but I think I want a different combat experience than what GW2 provides. So I may pass on HoT. With the launch of WildStar, I realize that what I want is more action-based combat. GW2 was a hybrid step in that direction, but it’s still tab-target based and not aim-based. Taugrim – I know it’s been since rift/star wars but I still wear my shirt I won all the time and one day hope to join you online again! Keep up the good work I always enjoy your new content! If you’re planning on playing CamelotUnchained or Crowfall, I’ll see you there! That all sounds nice, but does anyone truly have any faith the GW2 can execute? They’ve shown how unwilling they are to re-invest in the game. Their development teams are incredibly small, consisting mostly of young, underpaid recent college graduates. There is literally one person on the development team responsible for the most interesting content in the game. In short, outside of one person, the entire development team at ArenaNet aren’t talented enough to successfully pull off such an endeavor. There have been a steady stream of content updates (e.g. Living Story) and improvements to the game over time – at least on-par with if not more than a typical MMORPG. There might be one primary point-of-contact with the community (I don’t actually know) but that isn’t a bad thing necessarily. Can you provide links about the dev team size / experience? I’m curious to check out what you’ve read. Hey Taugrim – been following you for years, since SWTOR beta days and your keybind guides (I consider myself from the “Taugrim school” of keybinds…first thing i do on any game is erase WASD and bind W and R to strafe left/right respectively and E to move forward, if needed. :P ). First, I’d like to say, I know life is busy. It’s good to see you still put out content on the state of gaming as an industry in addition to specific games when you can. GW2 was my second real MMO after SWTOR. I saw ‘was’ because lately I haven’t had the time for MMORPG games and play more PvP oriented games in ‘short bursts’, similar to you with WoT. Smite is my personal favorite right now. Even though I don’t like MOBAs in general…Smite is 3rd person, all skill shots, and has Arena and other modes besides traditional ‘laning’ MOBAs. And it’s just plain fun. Anyway, I digress…I think I’m confused on how the GW2 F2P anouncement benefits me as a person who bought the core game already (and everyone else who currently plays or at some point played GW2..the customer retention point). I still pay $50 for the HoT expansion and a new person can now get the core game free…and just pay $50 for the expansion, same as me. Now if you just mean in general a game like GW2 releasing a new expansion is a form a customer retention because it gives them new content to play, then I see your point. I just don’t see how the latest announcement changes things for current players (other than the RAID announcement). I’m still publishing content regularly on WoT. Getting very intrigued by Crowfall. Haven’t tried Camelot Unchained but am looking forward to it. Both games are “World PVP” games and at least on paper are very appealing to me. I tried SMITE for a couple nights. It’s a good game and fun. For various reasons MOBAs simply don’t do it for me. I think I’m confused on how the GW2 F2P anouncement benefits me as a person who bought the core game already (and everyone else who currently plays or at some point played GW2..the customer retention point). Well, to some degree it’s a perception thing. The game today is now F2P. Prior to the weekend, it was B2P. So now anyone can get the game for free with a limited experience. That is, existing players felt like they were getting less for their money. Now, you could argue, the existing players who bought the game could or should feel shafted with the introduction of F2P now. However, there is a meaningful benefit to the GW2 community with F2P: meaningful player acquisition. Any MMORPG needs critical mass to be healthy. Beyond that, the F2P experience is limited, and any player who wants the full game experience still needs to purchase it. That’s no different than it was prior to last weekend. Anyone has always been able to pony up $50 USD to get the full game experience, regardless whether they were an early adopter or just got into the game in 2015. The only difference is a customer now has the opportunity to try a limited experience before they buy the full experience. It’s a win-win IMO. I think they did well handling it how they did and to be honest it can only be a good thing in the long run if it attracts new players to GW2, still a great game, sometimes it bores me but then that’s why we have so many other great titles out there, after reading some comments I think I’m going to look into Camelot unchained now too. Thanks, Kaz.